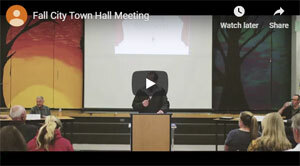 FALL CITY TOWN HALL MEETING! Fall City is a friendly, Snoqualmie Valley community that is approximately 26 miles east of Seattle with a population of around 5,000. We aren�t truly a city, but are an unincorporated rural town nestled along the banks of the Snoqualmie and Raging Rivers. This website is maintained by the Fall City Community Association, one of several volunteer community organizations that works with county and state representatives to maintain our rural charm. Learn more about Fall City. Time to renew your Annual FCCA membership!